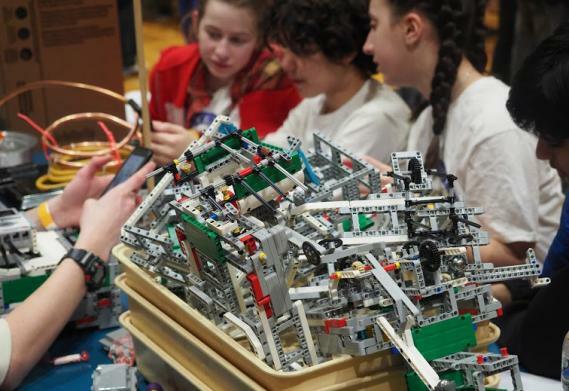 The School-Business Partnerships of Long Island, Inc. (SBPLI) FIRST® LEGO® League Jr., FIRST® LEGO® League, and FIRST® Tech Challenge seasons are officially underway across Long Island. Students and mentors from the programs, which collectively reach children in grades kindergarten through 12, are hard at work researching, designing, building, programming and testing models and robots that will best address the “Challenge” set forth this season. This season will also mark the 20-year anniversary of the FIRST Robotics Competition SBPLI Regional on Long Island. During MISSION MOON, FIRST® LEGO® League Jr. students (ages six to 10) will explore what kinds of problems they would need to solve in order to live on the moon. They will then create their own solution to one or more of these problems and showcase it in a Moon Base model. Teams will then present their models, along with a “Show Me” poster, during a series of Expos held at Mineola High School (March 2, 2019) and at Longwood High School (March 3, 2019). Echoing the space theme, for FIRST® LEGO® League’s INTO ORBITSM, students (ages nine to 14) are tasked with identifying a problem that humans must overcome to travel in our solar system. Examples include extreme temperatures, lack of air, and the need for water and food. Once a problem has been identified, students will evaluate current solutions and subsequently design, build and test an innovative solution, using a LEGO MINDSTORMS® kit. The children will then present the solution during one of six different Qualifier Tournaments being held at Mineola High School (January 26-27, 2019) and Huntington High School (February 2-3, 2019), with the chance of subsequently advancing to the Championship Tournament at Longwood High School (March 3, 2019). Finally, during FIRST® Tech Challenge’s FIRST ROVER RUCKUSSM (presented by Qualcomm), students in grades seven through 12 will don their engineering hats to design, build and program robots capable of collecting minerals from a crater, sorting and scoring minerals into the Cargo Hold of the Lander, performing autonomous tasks, and navigating to specific parts of the playing field. Teams will work in alliances to score more points than their opponents during 150 seconds of game play on a 12-by-12-foot playing field. Long Island students will then use these robots to compete in Qualifier Tournaments at Long Island Lutheran Middle and High School (January 6, 2019), a location TBD (January 12-13, 2019) and Sewanhaka High School (February 9-10, 2019). Competitors will have a chance to advance to the Championship Tournament at Syosset High School (March 9, 2019).